In a change of command ceremony in Port Hueneme, California, Capt. 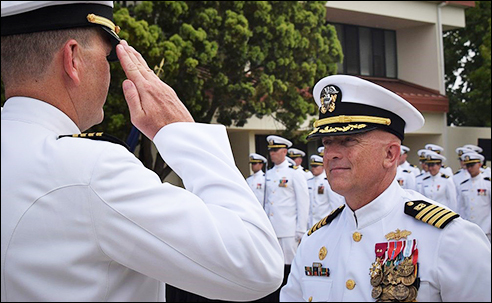 Christopher M. Kurgan (BE’90) became commanding officer for the Center for Seabees and Facilities Engineering and the Naval Civil Engineer Corps Officers School at Naval Base Ventura County. After assuming command in August 2018, Kurgan spoke of his plans to further innovation and the ongoing initiatives taking place throughout the training enterprise. Capt. Christopher Kurgan (right) assumes command from Capt. Glenn Hubbard during the Center for Seabees and Facilities Engineering change of command. The scope of the Center for Seabees and Facilities Engineering ranges from initial accessions training to a broad portfolio of programs that support sailors and facilities professionals in their careers, offer executive leadership training, and technological efforts to define, develop and produce training platforms to support warfighters and NAVFAC professionals. “You have my absolute commitment to continue to serve, to lead, and to always improve our confidence and our character,” said Kurgan. “I absolutely love this community. I love the Seabees, I love the civil engineer corps, and I love NAVFAC. Kurgan’s most recent duty station was Silverdale, Washington, where he served as commanding officer of Naval Facilities Engineering Command (NAVFAC) Northwest. Previous duty stations include tours as commanding officer of Naval Mobile Construction Battalion 133 in Gulfport, Mississippi; deputy commander for operations of NAVFAC Pacific in Pearl Harbor, Hawaii; and commodore of Naval Construction Group 1 in Port Hueneme. His early expeditionary tours included assignments with Naval Mobile Construction Battalion 74, Naval Mobile Construction Battalion 4, and director of Construction Southeast Asia where he deployed multiple times in direct support of global war on terrorism operations. Kurgan is a Seabee Combat Warfare Officer, a registered professional engineer in the state of Ohio, and a member of the acquisition professional community. A native of Illinois, Kurgan was commissioned in 1990 through the Naval Reserve Officers Training Corps program after earning a bachelor’s degree in mechanical engineering from Vanderbilt. Kurgan has a master of science degree in civil engineering from the University of Colorado.